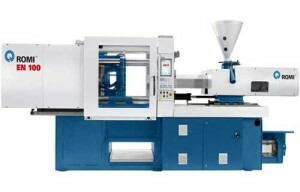 A UK manufacturer of plastic components says a new injection moulding machine is using between “a quarter and a third” less energy than its existing machines in the same tonnage range. Worthing-based Nordell, which produces bespoke and standard products as well as tooling for an international customer base, says the installation of its new Romi EN 100 machine was originally as a replacement model, but “booming” business has seen the company add it to its existing line-up. Nordell bought the EN 100 with one particular contract in mind. However, the company says it is now fully utilising the machine 24 hours, five days a week to produce a broad range of items. Romi says virtually all thermoplastics and elastomers can be processed on the EN 100, including high performance grades of LCP, PAA, PBT, PEEK, PEI, PPS, TPE, TPU, blends and specialist compounds. “The maintenance on the Romi EN 100 is minimal and the results consistently good. The new graphic user interface is very logical so although there was a learning curve, it wasn’t onerous,” Price added. Nordell is a privately owned company, originally formed in 1968 in a former incarnation. It has its own tool making and mould design facilities. It is ISO 9001 quality certified along with ISO 14001 and UL746D.